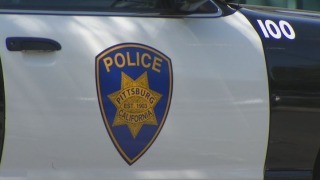 File image of a Pittsburg police car. A Pittsburg woman has been arrested on suspicion of killing her parents, after she confessed to the crime, a police captain said Saturday. Menique Lashon, 50, was booked into Contra Costa County Jail, according to Pittsburg police Capt. Ron Raman said. Police responded to a home in the 4200 block of Diehl Way at 10:30 a.m. Friday. The woman who called - later allegedly identified as Lashon - told police her parents were dead inside the home, Raman said. Officers found the bodies of a 67-year-old woman and a 73-year-old man in the home, Raman said. The two had been stabbed multiple times and appeared to have been dead for a few days, he said. Raman said Lashon lived with her parents. According to Raman, the suspect tried to make it look as though the stabbings happened as part of a fight between her parents, and allegedly tried to clean up the crime scene before she called the police. The incident is still under investigation, Raman said, and more information will be provided as it becomes available.